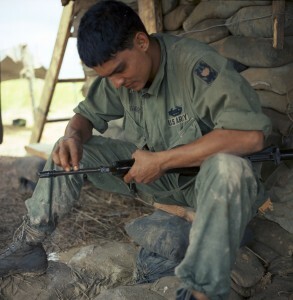 Photographs are a powerful part of our collective memory of the Vietnam War. Many of the iconic photographs were taken by photojournalists working for newspapers, magazines, or wire services. But there were also military photographers in Vietnam serving in our armed forces. They took thousands of photographs that covered every aspect of the conflict—photographs that are now part of our National Archives. Their assignments sent them everywhere: the jungles and swamps, forward bases, hospital ships, rivers, and air bases. Unsanitized and uncensored, these indelible images give an intimate and ground up view of the war and those who fought it. Most Americans knew almost nothing about Vietnam before the war. Many soldiers, sailors, and airmen seeing Vietnam’s dense jungles, rugged mountains, murky swamps, endless rice paddies, and brown rivers for the first time must have felt very far from home. 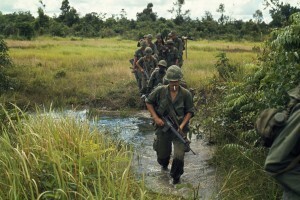 Here, “Members of Company B, 1st Battalion, 27th Infantry Regiment (Wolfhounds), 25th Infantry Division, cross a stream approximately 15 kilometers southeast of Nui Ba Den during search and clear operations near Fire Support Base Kien” 8/21/1970. Wars are often summed up and remembered through artifacts. The Vietnam War created its own set of memorable objects, many of which appear in military photographs, including helicopters, M-16 rifles, graffiti-covered helmets, Phantom jets, peace symbol necklaces, and body bags. 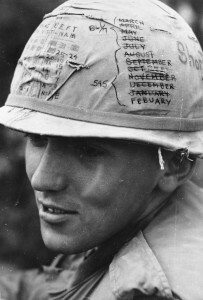 Here, “Vietnam. . . . A Sky Trooper from the 1st Cavalry Division (Airmobile) keeps track of the time he has left on his ‘short time’ helmet, while participating in Operation Pershing, near Bong Son.” 1968. War puts individuals into extraordinary and dangerous situations. Such circumstances fostered determination, anxiety, exhaustion, boredom, compassion, exaltation, and dread–feelings that are seen in the faces of those who were there. 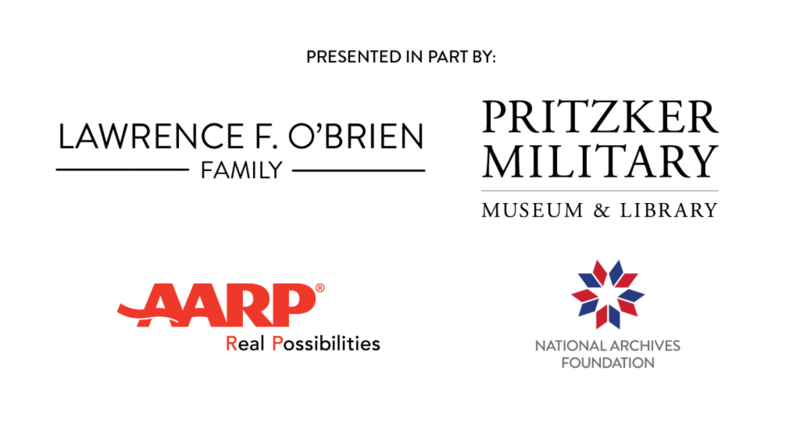 Click here to learn more about the National Archives Traveling Exhibit Service (NATES). If you would like to host a National Archives exhibit, email NATES@nara.gov or call 816.268.8088 for more information.